Preparing a ribeye steak on the Foreman Grill is absolutely ideal. In fact, it is probably the best cut of steak for indoor grilling. 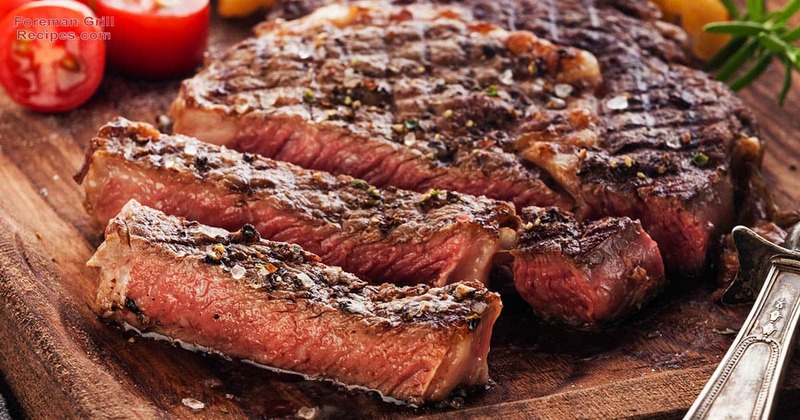 A ribeye steak is one of the most popular cuts of steak. It’s considered tender and has a wonderful balance of fat and meat. It’s this ‘marbling’ that makes ribeye steaks one of the best selling cuts of steak for grilling. The ribeye steak comes from the rib primal of the cow. This rib section does not have to support the weight of the cow and thus remains tender from now having to be subject to hard work or exercise. A ribeye steak is also sometime known as a Delmonico steak. For best results on the Foreman Grill, use steaks that are 1/2″ thick to 3/4″ thick. Place olive oil, Worcestershire sauce, soy sauce, garlic, pepper and rosemary in a bowl and mix well. Place steaks in the marinade, cover and place in fridge for at least 1/2 hour. If you can marinate them for a few hours or even over night – even better! Preheat your Foreman Grill with the lid closed for at least 5 minutes. Use ‘high’ setting if you have it. Place steaks on grill and close lid. Rotate steaks after 3 minutes to get the nice cross grill marks. Cooking times will vary but will generally be 4-7 minutes for rare, 6-9 minutes for medium-rare. Can I grill bone-in ribeyes? Yes, you can make bone-in steaks on the grill. I make the best steaks on the George Foreman Grill. I just got a foreman grill and have been looking at recipes. They all look good and easy but I have no idea what temp I should set my grill to. HELP! I have tried several temps and i always cook my steaks on high now. They come out very tender on high for a one inch thick ribeye 12 to 14 minutes for well done. I’m curious I got a great deal on 6oz ribeye steaks and was wondering if the cooking time is different. I like my steak medium rare but when I fallow the instructions on the package I get it well done not to my liking but still good. Hey Dwight, the cooking times above are a good ballpark time for cooking on standard Foreman Grills. Fillet for example will be rare from 3-5, medium from 5-6 minutes and medium/well to well from 7-9. Larger cuts like Ribeye take about a minute longer for each because of size as well as fat content. If you want rare for a Ribeye shoot for 4-6 minutes. 4 for thinner ones and 6 for thicker cuts. Wow!!!! the steak looks great, um, yum, but hurry with the pie recipe. I’m a pregnant woman craving chocolate, and well, what a way to go. Thanks. I never knew you could cook a steak on a Forman Grill. I got ttwo thinner ribeye steaks at So Low Grocery Store for 5 bucks. They are very tender. I thought grilling would be good but it’s raining. This is the next best thing. I can grill inside with Julian potatoes and baked beans on the side. Thanks for the hot tip. I live in an apartment. When I cook a ribeye on the stovetop the smoke alarm goes off. With the GF grill I get great steaks and not smoke alarm. Great product. My George Foreman grill temperature control is in degrees, what temperature do I set it at for medium rare 1” ribeyes? Recently I purchased a couple of rib eye steaks for myself my daughter and her fiance…. We cooked them on the GF they were great I also purchased some marinated in the bag you heard right no mixing or measuring ingredients by Jack Daniels they offered different kinds I went with regular steak marinate but very good my steaks were delicious and bag held 3 riveted…. Very convenient! I want to cook 2 rib eye steaks medium well, on my home Foreman Grill. What’s the timing?